I did my craft market on Friday, which left the studio in a mess, with all the usual last-minute stuff-making. On Saturday–BIG CLEAN. 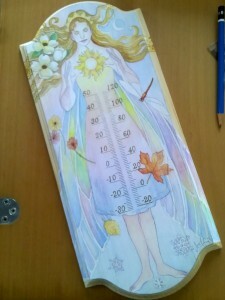 I finished in the late afternoon with my desk clean except for the current project: A commission of a watercolour fairy on a wood plaque. My desk was deliciously empty; I knew everything that was on it. Found myself painting Saturday afternoon (and watching the Singapore government websites mysteriously go down). On Saturday night, the fairy plaque was brought to the living room for a bit so I could prime new parts of the wood while watching TV. Sunday: Well, I don’t know when I started noticing it, but my watercolour palette could NOT be found on my desk or in my room. I had not moved it out of the room (I had been using some disposable plastic for my primer, NOT my watercolour palette). I didn’t think too much of it, but coming into my workspace this Monday morning, and gazing at my desk with ALL my fairy plaque stuff and STILL no palette, I was flummoxed, and started looking in drawers and closets, re-thinking maybe I’d packed it away during Saturday’s clean out of absent-mindedness. The project on my desk as it looked when it was almost done. I started looking outside the room, in the bathroom, in my father’s office. My mind was going: I don’t understand. I didn’t move it from the room. My desk is so empty, and I’ve checked all the surfaces, all the drawers, and the closet, and this, and that, and etc. What am I not thinking of? Or is it the fairies? Why would the fairies hide it when I’m painting a fairy right now and just want to get back to work? Outwardly, I said, “What the hell?” I gave up looking in my father’s office, and returned to my own. TO SEE THE PAINT PALETTE ON MY DESK, OPEN, ITS BRIGHT COLOURS GLARING AT ME from the sea of birch that is my desk. It had NOT been there before. I swear. I stare and stare, and I sit down in my chair, and STARE some more. I do my self-checks: no heebie-jeebies whatsoever, the room is warm and my body is comfortable, my brain has been stunned into silence. Outside is this sense of curiousity, of how is she reacting? Inside, I get the strongest urge to laugh. So I do, and apologise for cussing, and while I welcome them I’m not sure how I feel about my art materials going missing, but what just happened was fine because… I’ve never been given such a physical sign of proof before (well, besides the plants around the house growing like crazy) and I do get that it was funny. Of course, after the conversation, what I had to do next was get to work. So I did. And now I am again.